Learn how to make your own set of placemats in this month's project. 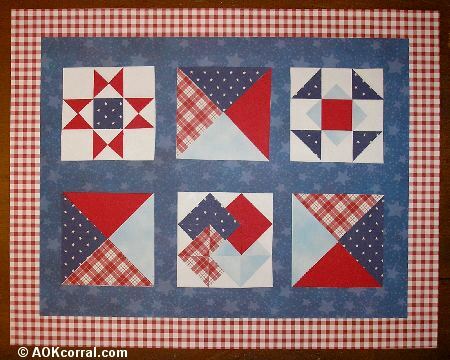 You will create a quilted placemat look using different paper styles and colors. 1 Poster Board Sheet for each placemat - 11" x 14"
You can change the color scheme to match whatever theme or décor you are making the placemats for. If you are not sure how to select your own colors and patterns for this design follow the instructions below. 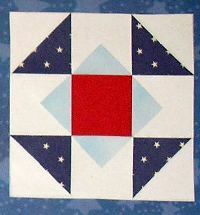 These quilt blocks are made with a combination of 1" squares cut crossways into triangles and then cut again into smaller triangles or 3" squares cut crossways into triangles and then cut again into smaller triangles. 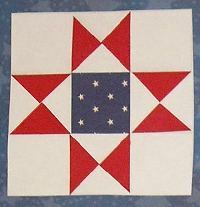 Each quilt block is put together with glue stick onto white printer paper and then cut out so they can be assembled onto the placemat as a completed quilt block. Measure and cut 1" wide strips of each color. Measure and cut the strips into 1" squares. Make your squares into triangles: Using the straight edge of a ruler, draw a line across the back of the square from one corner to the alternate corner. Cut along line. You now have 2 triangles. Make your 2 triangles into smaller triangles: Using one of the triangles as a guide, place it’s top point at the center base of the other triangle and then make the edges of the triangles line up together. (This will help ensure you have a straight line down the center of each triangle.) Draw a line from the top of the triangle down to the center base of the triangle along the edge of the paper. Do the same thing to the other triangle. Measure and cut one 3" square for each of the following colors: Color #1 - Dark and Light, Color #2 - Dark and Medium Patterned 1. 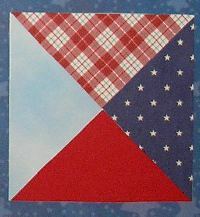 Follow the same cutting directions given in steps #3 and #4 above to make these squares into triangles and then into smaller triangles. Using Color #2 - Medium Patterned 2, cover the entire sheet of poster board with this paper color. 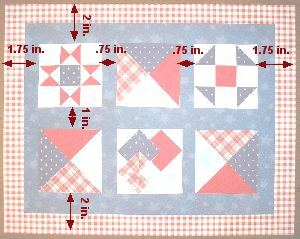 Make measurements for the placement of the quilt blocks as shown in the chart. Do the same with the contact paper for the back. Then trim the excess down to about ½ inch from the poster board edge. 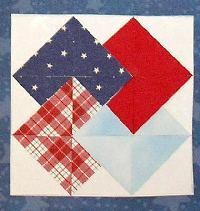 Use the color shown in this project for some great 4th of July Placemats for your next picnic or change the colors to match your decor or the season.